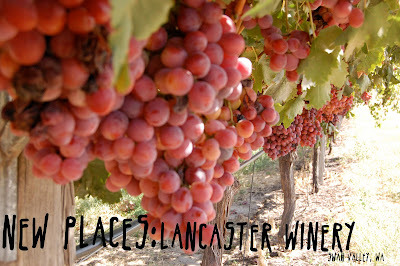 Lancaster Winery is located in the Swan Valley, in Western Australia. Not, as many people may think Lancaster, Pennsylvania. Because we had visitors from the Lancaster, PA region here last week we thought that it was fitting that we go and visit the winery. since we were already hanging out in the Swan Valley. I liked this winery because it isn't all fancy and posh. It is simply just a tasting shed out among the vineyards. It is not filled with tid bits and souvenirs, just people hanging out tasting wine and cheese. You feel like you are really where the wine is being made, it is not dressed up, just quaint and lovely, the scenery is gorgeous. Lancaster does not sell their wines in bottleshops, they are exclusive to the tasting shed and on their website: http://www.lancasterwines.com.au/ if anyone is interested. I unfortunately only had a teeny tiny sip of Joel's wine, but wanted a lot more! From the verdict of the wine tasters there with us, Joel and his Uncle and Auntie, they are pretty great wines. The prices are also pretty good, ranging from $14-$79. I will be making sure that we head back there when I have had this baby, and Joel will be the designated driver this time!! Although I wasn't tasting, I did get to enjoy the location! It was really lovely.